The apartment in Rosas / Roses has 1 bedrooms and has capacity for 4 people. The apartment is cozy, is very luminous, and has 45 m². It has views to the garden. It is located 1,90 km from Distance to the beach sand beach, 1,50 km from Distance to the city city, 1,30 km from Distance to the supermarket supermarket, 1,20 km from Distance to the bus stop bus station. The house is situated in a residential neighborhood in a mountainous zone. 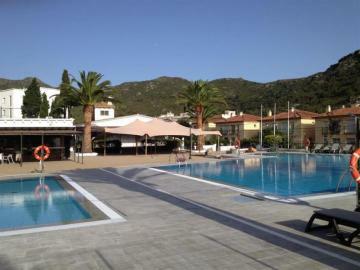 The accommodation is equipped with the following things: safe, communal swimming pool, TV. Kitchen: refrigerator, microwave, dishes/cutlery, kitchen utensils, coffee machine are provided. Roses is a major tourist center with modern hotels, beautiful beaches and two ports (fishing and yachting). The coast of Roses includes a long sandy beach while further east you'll find a large number of coves, among them Canyelles Petites, L'Almadrava, Cap Norfeu, Punta Falconera, Jóncols and Montjoi. Some of its beaches have received the Blue Flag award, a symbol of quality for having a clean and safe environment. Roses is an essentially Mediterranean town with a notable tourist and seafaring tradition. It occupies a unique natural setting, in the northern part of the Costa Brava, less than 30 km from the French border, 65 km from Girona and 160 km from Barcelona. The major tourist center, with housing developments, hotels, beaches and two ports (fishing and sports), is an attractive place within the northern sector of the Costa Brava. The coastline of Roses includes a long sandy beach. Roses is a bustling town year round. Its range of activities and attractions is very appealing to all types of travelers. Drive a go-kart, enjoy a day at the water park, play mini-golf, take a boat trip to Cape Creus or a ride on a tourist train – these are just some of the possibilities Roses offers for your leisure time enjoyment. - Refrigerator, Microwave, Dishes / Cutlery, Utensils / Kitchen, Coffee maker. - 1 Bathroom with bath tub. - 1 Floor, Safe, Pool Communal (dimensions 10x10 m), 45 m² Living area. IMPORTANT: After making the reservation, please send us the following information: complete name, passport or ID number and date of birth for all tenants. RENTAL COST. The rental cost is the one indicated in the particular conditions of the booking's confirmation or contract, where the costs for rent, administration and all the extra services that the client has contracted are stated. RECEIVING THE KEY. When he is handed the key the client will pay the rest of the amount stipulated in the reservation contract, in cash only, and will sign the corresponding holiday rental agreement for the contracted period. RENTING PERIOD. The period for which the accommodation is rented is specified in the contract's private conditions, the keys will be handed between the hours of 16:00 and 20:00 from the first day of the contracted period, in case it is absolutely impossible for the client to arrive within the above mentioned hours, there will be a 50,00 € fee and the owner has to be informed with regards to the foreseen arrival time so the staff can adjust to the mentioned schedule changes. We do not hand over the keys after 22h, in case the client arrives later, he will have to pick up the key the next day in the morning. In any other case the owner is free from any obligations, the lessee losing the payment that he made when confirming the booking. The departure will be on the established day before 10:00 am, the owner has to be informed 24 hours in advance with regards to the exact hour of departure, the tenant being responsible for leaving the accommodation keys in our office and also for leaving the accommodation in the same condition as found. DEPOSIT. When handed the keys, the tenant will sign a document that authorizes the company to charge a fee from his credit card for the amount indicated as a warranty. At the end of his stay, the client agrees to turn in the accommodation, the furniture and the utilities in the same condition they were found in, making himself responsible for any damages that occur during his stay as a result of his actions including damages caused by any pets. Otherwise, the amount corresponding to cleaning, fixing or substituting any of such damages will be taken from the warranty deposit. ADMINISTRATION COSTS. The contract issuance costs are included in it, under the name of "administrative expenses" and the amount per day is of 6,00 € / day. SUPPLIES. The costs for supplies are included in the total price except for special cases that will be personally communicated to the client. In accommodations whose provisions are gas bottles and these become empty, the client has to contact the owner and take the bottle to him within opening hours, so that he can get a new one. COMMUNITY STANDARDS. The accommodations that are located in a community, with neighbors around, will have their own rules and regulations and/or ones of the community. If there are any community facilities like a pool, tennis courts, etc… they are not opened throughout the entire year, the dates in which they are open or closed depend on the weather, number of guests, hygiene routine and other factors. For this reason the owner will not be responsible for such facilities not being open within a community complex, for any factors that are not related to his management as an intermediate, the same way the clients will be responsible for their safety in using the mentioned facilities. 1. The excessive number of occupants in an accommodation, for which the owner may ask for the name and ID of each one of them at any point. 4. The performance of any activity that contravenes the municipal regulations, the cohabitation regulations, the hygiene ones and the common public rules or of activities that deprive other tenants of the accommodation, complex or urbanization of rest. 1. Any theft, loss or damage that the clients may suffer during their stay in the rented accommodation, even in cases when they also rented a safe deposit box in their room. 3. The breakage of electromechanics or any other type of appliance in the accommodation will be reported to the owner and he will contact the Technical Department in less than 24 hours, but the lack of assistance from their part shall not be grounds for compensation from the owner. 4. Works that are developed by the city hall or any other institutions besides the owner's company, can be conducted nearby or in the same building and may affect the regular demarche of the tenant's stay. 5. The WiFi service comes from external companies that do not cover all of the apartments that the owner manages, thus in case the connection is deficient, the owner will refund the amount charged for the said service, prior to the supplier's authorization, without the client being able to blame the owner for the lack of connection. In case the client rents an accommodation and the said accommodation cannot be put at his disposal, the owner takes it upon himself to offer the client another accommodation of similar or higher category and in case the client is not satisfied with it, the amount of money that was paid to the owner for his intermediate management will be refunded.